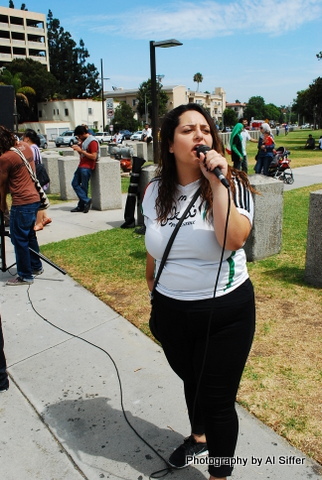 left: A local protester speaks to a small crowd of protesters. Right: Local protester holds signs at a local rally last Friday. By the time I got to the one at the Consulate, there were almost more policemen than demonstrators. 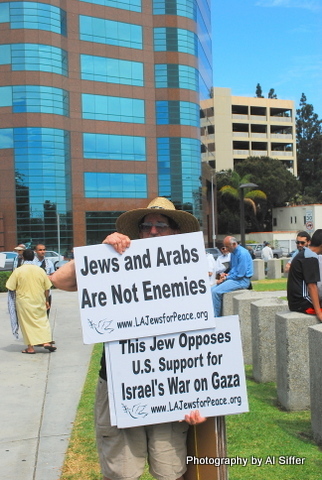 The protest was sponsored by LA Jews for Peace and other groups. 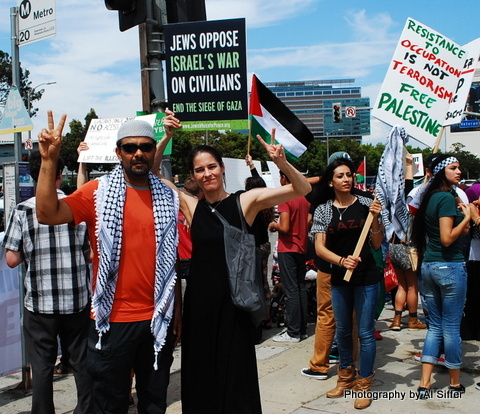 I did see one counter demonstrator who was in support of the Israeli Military. He didn’t seem well informed about what was happening, so no one argued with him. There was an American of Egyptian descent who was interviewed and talking with passersby. He was very articulate in his beliefs that both the Israeli Military and Hamas are guilty of war crimes, and that the U.S. government bears guilt for aiding the Israeli Military. Despite their different religious affiliations, these protesters stood united against the recent violence in Gaza, which entered its 22nd day on Tuesday. The demonstration at the Federal Building was much larger and more boisterous. It was a diverse group. Muslims, Jews, and Christians—families with children—old people—young people. I saw no counter demonstrators except for the lone counter demonstrator at the Israeli Consulate and possibly one of the demonstrators I saw at the Federal Building; there was passion and anger and sorrow for the lives of innocents lost, but absent of bigotry and chauvinism.